Heat the oil and roast all the ingredients for the sambhar masala in it. Grind to a fine paste. Keep aside. Wash and pressure cook the dal, onion, brinjals, bottle gourd,drumstick, and potato with 2 cups of water. Mash the vegetables in the boiled dal. Then add the tamarind pulp, salt ,sugar and 4 cups of water and bring to a boil. Prepare the tempering by heating the oil and frying the mustard seeds, curry leaves, asafoetida,1tsp urad dal,1 tsp moong dal and dry red chilies until the mustard seeds crackle. Now add chopped tomatoes and cook till the tomatoes become compeletely soft. Now add rest of the vegetables in the tempering pan along with 1/2 tsp salt and 2 tbsp of water and cook till the vegetables are crunchy. Now add sambhar masala and 1/2 cup of water and cook for 2 minutes. Add this to the sambhar and simmer for 15 minutes. 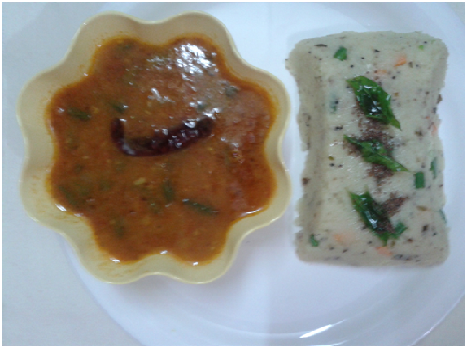 Serve hot with upma,idli ,lemon rice,steamed rice,uttapam,vada or dosa. You can use more or less of vegetables as per availability of vegetables. You can use 3-4 tsp ready made sambar masala or sambar mix available in market. Add mustard seeds,when they start to crackle add the chana dal and urad dal. Fry till they start to brown a little. Add ground nuts and let them get browned. Now add onions and fry till they become transparent. Add the green chilly, ginger, curry leaves and fry for a minute. Add all the vegetables and when they become tender add the roasted semolina to it. Now add water to this mixture and let it come to a boil. When the water comes to a rolling boiling, lower the flame and keep on stirring . The semolina will absorb water and swell and begin to cook. If the mixture looks dry, then add some more water. Keep stirring so that the upma leaves sides of the pan. Garnish upma with curry leaves and mustard seeds by making a tempering of the two in a little oil. 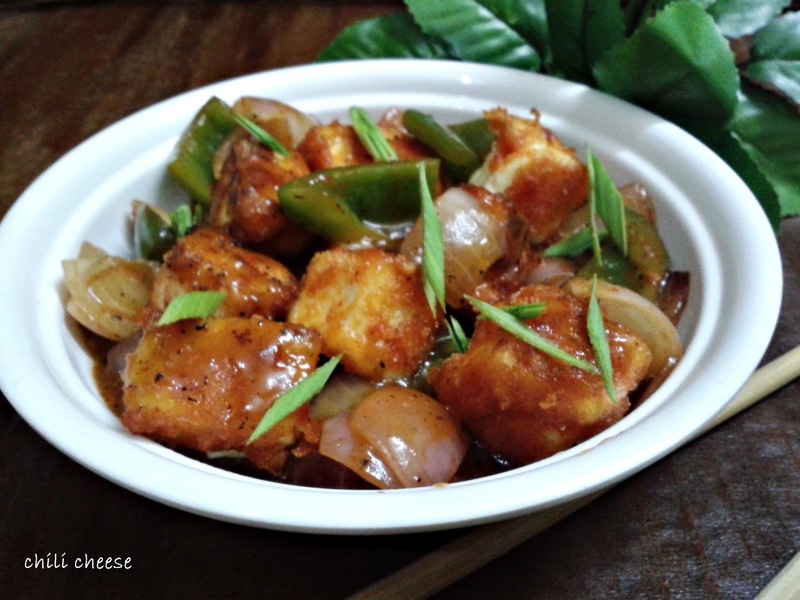 Serve upma with hot sambhar or coconut chutney. You can boil chana dal (in an open pan for 5-10 minutes) and vegetables before adding them to the upma. Heat the oil in a pan add cumin seeds,asafoetida powder, dry red chilies and onions and saute till onions turn golden brown in colour. Add the ginger-garlic paste, mix well and cook for 2 minutes on a medium flame. Add the tomato puree, chilli powder, coriander powder, turmeric powder, sabzi masala and salt and cook till the oil leaves the masala. Add 1/2 cup of water and bring it to a boil. 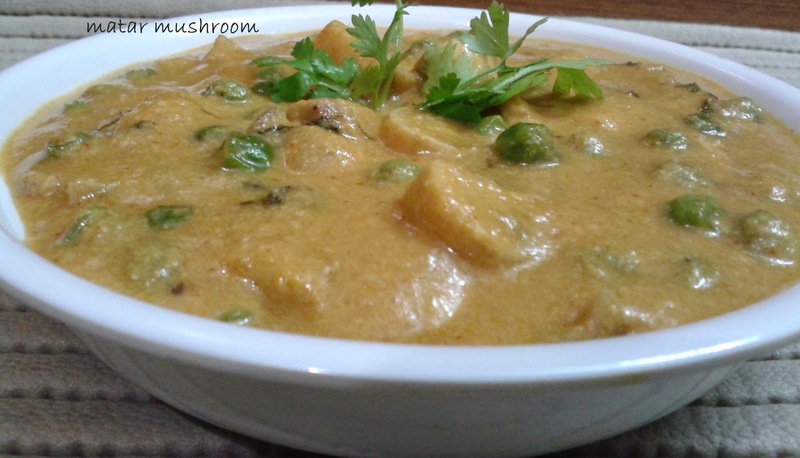 Add the green peas and mushrooms and simmer for 8 to 10 minutes or till the green peas are cooked. Add the cashewnut paste , melon seed paste and fresh cream and mix well. 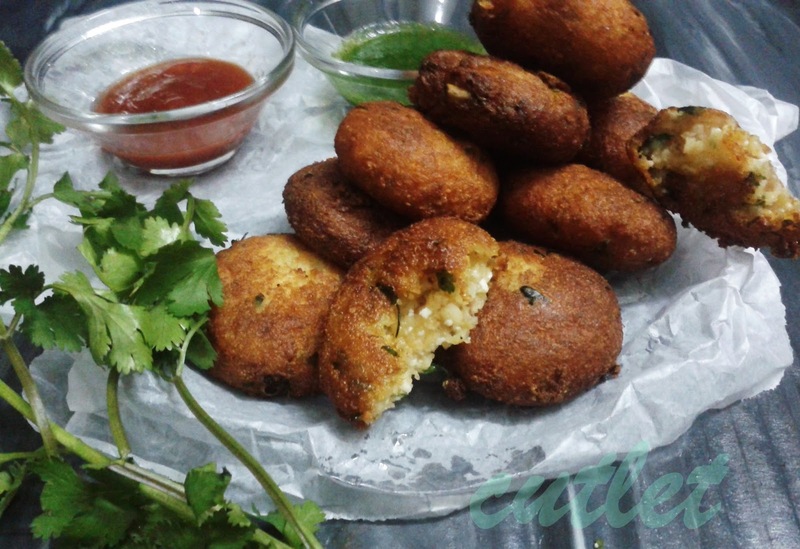 Mix 1 tbsp each of maida,besan and corn flour with approximately 3-5 tbsp of water ,1/2 tsp salt and red chili powder to make a thick batter or coating consistency. Coat the cheese cubes with the batter and deep fry then in hot oil. Keep them a side. Now in a pan take 2 tbsp oil and fry the green chilies,garlic,onions and capsicum. Add the fried cheese and cook for 2 minutes. Boil cauliflower,carrot and brinjal in 1 cup of water in a pressure cooker till 2-3 whistles and after the pressure releases mash the vegetables with the help of potato masher in the cooker itself. Take a kadahi and melt the butter add chopped onions,ginger and garlic and cook till the onions are light brown in colour. Add chopped tomatoes,green chilies,peas,capsicum,french beans an stir till the vegetables become tender. Now add all the spices like pav bhaji masala, coriander powder, red chili powder and salt. Now add boiled potatoes and mashed vegetables and 1/2 cup of water and cook for 15-20 minutes till you reach the desired consistency of the bhaji. Now add chopped coriander leaves ,lemon juice and ketchup. Slice each pav into 2 horizontally. Apply a little butter to each side. Heat a large tava and cook the pav on both sides till the pieces are lightly browned. Serve the hot bhaji on individual plates and top with the chopped onion,tomatoes,green chilies,coriander and a small cube of butter. Serve with the hot pav , lemon wedges,salad and cold drink. Peel Arbi ,wash it and pat dry. 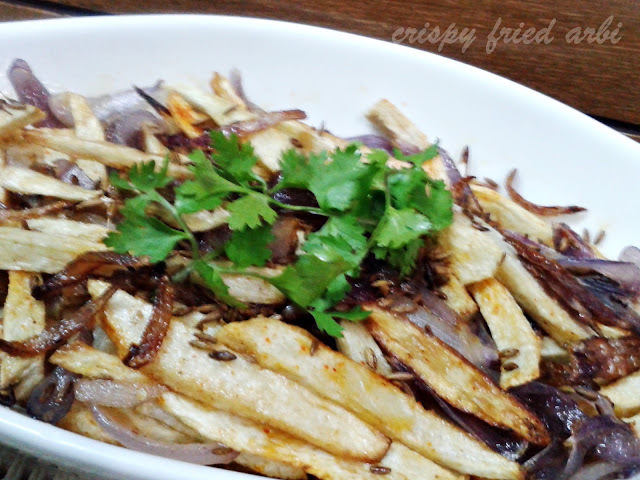 Heat oil in a kadahi and fry the slices of arbi in it. Drain out the Arbi from oil on a tissue paper or kitchen towel. Fry the onions till light brown in colour and drain these out on a tissue paper (or you can stir fry the onions in a tea spoon of oil in a separate pan). Mix onions,Arbi and rest of the ingredients except jeera. Dry roast cumin seeds on a Tava and sprinkle it on the Arbi. 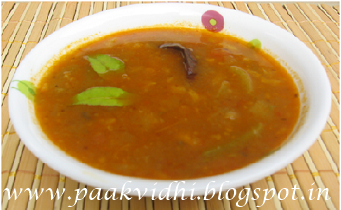 Serve hot with daal and chappati. 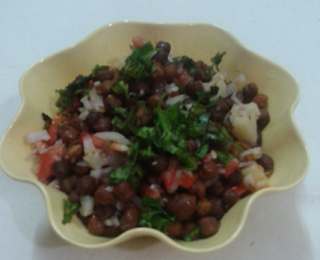 Wash and soak the chana dal for 1 hour and drain. In a pressure cooker add the chana dal, garlic, ginger, green chilies and ½ cup of water, mix well and pressure cook for 2 whistles. Drain. Add the chana dal, green peas, spinach and blend in a blender till smooth using ½ tbsp water if needed. Transfer into a bowl and add the paneer, salt, garam masala, chaat masala and ¼ cup bread crumbs, mix well. Now for filling take oil in a pan add jeera and when it starts to splatter add grated ginger, green chilies, mushrooms and then rest of the ingredients and cook for 2-3 minutes and keep a side. Now make a ball of one portion of kebab mixture, flatten it and place 1/2 a spoon full of stuffing in it's center and wrap the stuffing with kebab mixture like you put stuffing while making parantha and give kebab desired shape. Dip each kebab into the prepared flour- water paste and roll in the remaining bread crumbs. Heat the oil in kadhai and deep-fry them till they are golden brown in colour from both the sides. Cut the kebab length wise and serve hot with tomato ketchup and green chutney. You can also cook the kebabs on a greased tava (griddle) by following the same procedure and cook until golden brown in colour from both the sides. Coat the balls with bread crumbs and fry in hot oil. Try frying one cutlet if it splatters then you can add more bread crumbs or a tabsp of corn flour. Take hung yogurt in a bowl and mix sugar and salt and blend it well. Deep fry the canapes in hot oil or bake them in OTG. Place one or half cutlet as per size of canape in the canape cups. 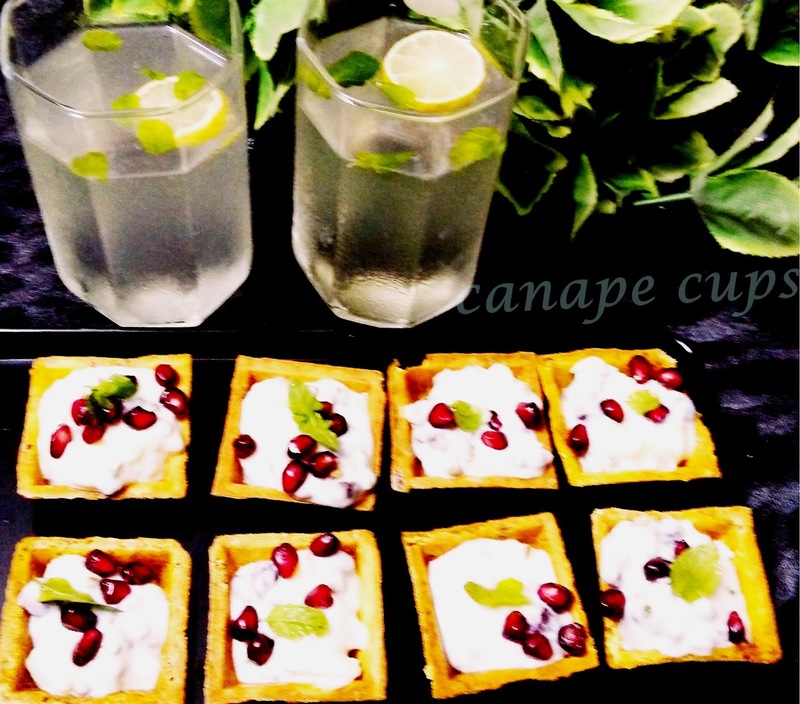 Garnish with coriander or mint leaf and serve immediately. 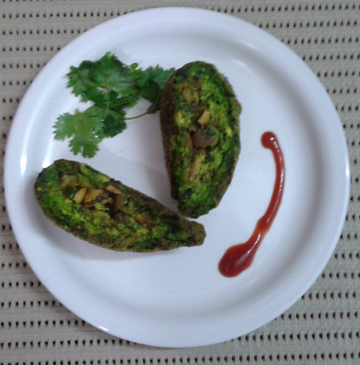 You can use bhalla ,sprouts boiled or fried potatoes and crushed paapri instead of cutlet as per choice. You can fry or bake canapes and store them in an air tight container and all the other things ready but assemble the canape only at the time of serving because otherwise they will become saggy. Soak the black chick peas over night and drain the water. Take 4 cups of water in a pressure cooker, add salt to taste and pressure cook for half an hour. Check whether they are tender or not if required you can cook for some more time. If there is water then cook without lid on high flame till they the chick peas are almost dry. Now remove from flame and put them in a bowl. Add chopped onion,chopped tomatoes,green chili,boiled potato,red chili powder , chaat masala and salt in to it. Take a pan and heat the oil now add jeera and hing powder and pour the tempering on the chaat and cover with a plate for 10 minutes so that the aroma of the tempering is absorbed in the chaat. Now add lemon juice and chopped coriander and serve hot or cold. You can use white chick peas instead of black chick peas. You can also make the recipe with sprouted chick peas after boiling them for 10-15 minutes. Heat oil add onions stir fry for 1 minute add all the other vegetables stir a bit and add salt pepper and sugar. For spring roll sheets sift flour and salt and gradually add water and make a smooth dough. Keep the dough on rest for 10-15 minutes. Now take two lemon sized balls of dough and roll out into a really thin translucent roti using maida for dusting. Keep aside. Now roll out another part in the same way. Brush with oil, sprinkle lightly with all purpose flour and place the first roti on top of the second one. Roll out both the rotis together again and spread them to the maximum with the help of rolling pin. Now, cook this roti on a medium hot Tawa/pan for 10 seconds on one side then flip the side and cook the other side as well for 10 seconds. Lift off from tava and carefully peel open to separate the two rotis that were earlier stuck together. Make rest of the sheets the same way. In a bowl, mix 3 tbsp all purpose flour and 2 to 3 tbsp water..
Now take one sheet and keep the cooked side facing you. make sure that the sheets are at room temperature before using them. Now with your fingertip, apply the paste on the edges of the sheets and place 1 tbsp of the veggie stuffing in the center lengthwise. Seal both the sides from sideways. spread some batter on the sealed edges then bring the open side on top of the roll. Press gently and seal it. Do the same with rest of the sheets. You can brush them with little oil and keep them in fridge wrapped in a foil of cling film till the time of serving. Deep fry at the time of serving. 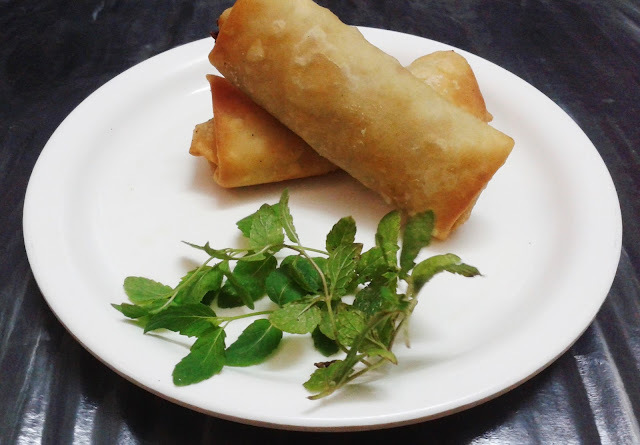 Heat oil in a pan or kadahi and gently slid on spring roll in medium hot oil . Deep fry them till they are crisp and golden in color from all the sides. Remove them with a slotted spoon and keep them on a kitchen towel or absorbent paper. 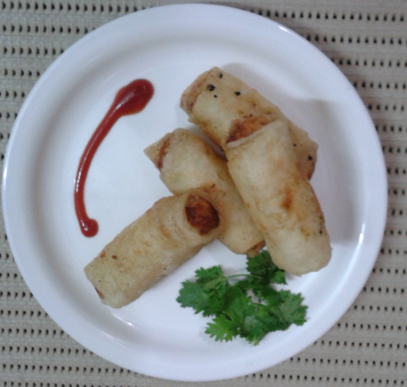 Serve the spring rolls hot with red chili sauce or tomato ketchup. Heat oil add onions stir fry for 1 minute add all the corn and grated cheese stir a bit and add salt and pepper . For pancakes sift flour and salt and gradually add water or milk, egg or soda-bi-carb and make a smooth batter. Heat a non stick pan and make pan cakes cooking underside only don't cook the other side. Place the filling on cooked side of the pancakes at one end now fld left side and then the right side. Seal the edges with the batter of pan cakes or cornflour disolved in water. Heat oil in a pan and shallow fry both sides of the roll till golden brown. Drain out of oil and serve cutting diagonally. Note: If you find it difficult to roll the pan cakes then make a chapati like dough using less water or milk and more of maida then wrap the stuffing in the chapati and and deep fry the rolls.